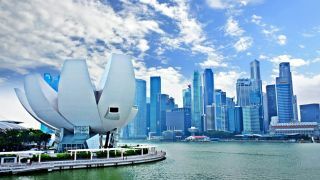 Long renowned as one of the world’s foremost trading hubs, Singapore is looking to lead the way on becoming a global leader when it comes to smart city technology. With the likes of Japan, South Korea and China all nearby, and also hoping to strike ahead in futuristic technology, the challenge of staying out in front is greater than ever. So how does a country the size of the Isle of Man ensure its work is recognised? "There was a determination to transform what we do with technology," Chan Cheow Hoe, the Singapore government chief information officer, told TechRadar Pro. Singapore is of course in a rather unique position in being both a city, and a country in its own right, meaning the challenges faced by Cheow Hoe and his team are even more in the public eye. Fortunately Cheow Hoe is also the deputy chief executive of GovTech, the agency responsible for implementing technology into everyday life meaning that his projects are often well-supported by the Singaporean government and see encouraging pick-up. This is particularly crucial when it comes to smart cities, as the Lion City looks to stride ahead in its bid to be an example to the rest of the world. Cheow Hoe joined the Singapore government five years ago following a long career in banking, but in this time has helped transform the world’s 19th-smallest nation into one of the most innovative around. He and his small team have introduced and a wide number of smart services aimed at improving the lives of Singaporean citizens, quite literally over the course of their entire lives. The Singapore Government is soon set to operationalise the Moments of Life concept through an app, which aims to take the stress out of the main events of someone’s life with the help of technology. Cheow Hoe notes that for many citizens, the only occasions they contact the government concerns major life events, such as registering a birth, getting a marriage certificate, or notifying a death. The country is also looking at introducing a ‘Moments of Life’ app for Business which will look to streamline the process of starting a company, again taking the stress out of vital processes such as applying for a restaurant licence. Cheow Hoe notes that this whole approach is part of transforming Singapore’s government services from a transactional level to one of providing help, and hopefully removing any friction between citizens and government. "It's totally transforming the way we think about government services,” he says. The government is also responsible for running Singapore’s national digital identity programme, known as SINGPASS. Set up 15 years ago, the platform automatically registers citizens for all government digital services, and today, allows them to pre-fill forms for occasions such as setting up a bank account or applying for housing. Singapore’s work isn’t just dedicated to governing lives, however - but also saving them. One of the biggest successes for Cheow Hoe’s team was a mobile app that alerts nearby citizens trained in first aid when someone has a medical emergency nearby. The myResponder mobile app sends a push notification to anyone within a 400m radius of a cardiac arrest case, and so far over 14,000 citizens have signed up to the service - which has been responsible for saving an incredible four lives since its launch. So how does Singapore shape up as a smart city? The nation was quick to recognise the potential of technology, and today Cheow Hoe notes that there are hundreds of thousands of sensors around Singapore, gathering data from traffic congestion to utility readings. As mentioned, the city itself is essentially the country of Singapore, meaning that there are few headaches relating to geography and technology - like those seen in the UK’s rural broadband struggles. In fact, Cheow Hoe notes that there are very few networking challenges in Singapore, as the densely populated landscape of the 278 square mile nation means that it is easy to mount new hardware to help boost capacity. "Singapore is lucky,” he says, “we don't worry about connectivity and power because it is everywhere." Cheow Hoe highlights Singapore’s national fibre network, enough to allow that each home has two 1GBps lines - far and away ahead of the UK. The nation is also in the process of upgrading to 5G, however given its existing capacity, this is not as pressing a concern - despite having one of the highest smartphone penetration rates in the world. “We don't need everything in 5G”, Cheow Hoe notes, stating that making Singapore as smart as it can be is a more pressing concern. So where can Singapore go next? Cheow Hoe wants the nation to become a model to the rest of the world, and Singapore has in fact hosted the Digital Government Exchange event for some time, inviting figures from world governments to see the work it is doing and share knowledge on how to overcome the big global challenges. "Every country does something good, it's important we learn from them too," Cheow Hoe says, adding that cross-nation partnerships will become increasingly important as the world gets smarter and more connected.